in Kyoto’s Nishijin neighborhood for over 100 years. 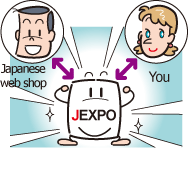 you choose to visit our shop. 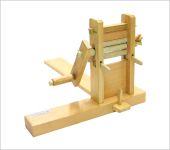 This traditionally designed weft bobbin winder is used by sitting on a cushion placed over the diagonal board for balance. Doing this allows you to use your body weight to operate the bobbin winder in a stable manner. 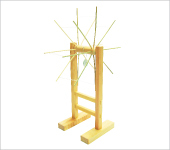 Used by placing the skein on the goko swift and then winding the thread using either a bobbin winder or a spool winder. 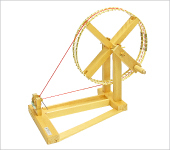 The circumference of the goko swift can be freely adjusted to fit the size of the skein by shifting the cotton threads. It is also easy to dismantle. It can handle skeins of up to about 145cm. This tool is used to remove seeds from cotton. It is also known as a “Cotton Gin” or a “Seed Remover”. The design of this cotton gin has been continuously improved for 30 years. It is currently being displayed in a number of museums, reference libraries, schools, and workshops. You can order the articles of this shop at JEXPO The prices shown on these sites don't include shipping expenses, packing fee, JEXPO fee. So you'll understand the whole price, and the conditions to get whole the commodities with the estimate.